Honda launched its latest generation of the City subcompact in Thailand yesterday, a fitting locale considering Bangkok is about as close as it's going to get to our shores. The attractive little sedan is priced at the equivalent of about $15,000 and gets power from a 1.5-liter i-VTEC engine, sending it to the front wheels through a five-speed manual gearbox. Gas mileage is expected to be top notch, but we're wondering about that front grille. Did Ford export some Dave to Southeast Asia? Full press release after the jump. Honda Begins Sales of All-New CITY in Thailand BANGKOK, Thailand, September 10, 2008– Honda Automobile (Thailand) Co., Ltd. (HATC), Honda's automobile production and sales subsidiary in Thailand, today began sales of the all-new CITY. The design of the new CITY is based on the total pursuit of a compact, yet dynamic form with road presence. In addition, class-leading*1 interior space was achieved to create a cabin that surrounds the occupants with an open and secure feeling. The new CITY is equipped with a 1.5-liter i-VTEC engine, which is further advanced in every way, including greater output and fuel consumption. Furthermore, with Honda's unique commitment to provide both advanced safety and environmental performance, the new CITY achieves the highest levels in every area in the effort to become the new bench mark for subcompact sedans. The first generation Honda CITY was introduced in 1996, quickly responding to the growing needs for automobiles in Asian markets associated with economic growth in the region. Today, CITY is produced in seven countries*2 and enjoyed by customers in 39 nations around the world. CITY also is becoming one of Honda's core models, along with Civic, Accord, CR-V and Jazz (Fit), with cumulative sales passing the 1 million unit mark in late May 2008. The sales of this third-generation CITY will begin in Thailand from today and expand successively to other existing markets. Honda also envisions further expansion of CITY sales, in order to meet growing customer needs, especially in emerging markets. Regarding production of the new CITY, HATC will support the startup of production in developing countries including ASEAN markets, India and China. Honda's automobile production capabilities in Thailand have grown continuously for more than 20 years, which is helping accelerate the advancement of automobile production in the region as a whole by providing technical support for other production operations in neighboring countries. Honda has been strongly promoting local autonomy by transferring more production and procurement functions from Japan to Thailand with the goal of strengthening Honda's production strategy and to increase local parts sourcing. In addition, increased coordination with local R&D and production engineering functions (production equipment and tooling) is supporting the advancement of Honda production operations in Thailand as the leader plant in the region. As a result, the local content of the new CITY has now reached 93% from 83% of current model. The second HATC plant will begin operation in late October of this year, expanding the total annual production capacity to 240,000 units. HATC will also expand auto exports and technical support to other operations to enhance its role as the leader plant, and strengthen it's competitiveness in the world. 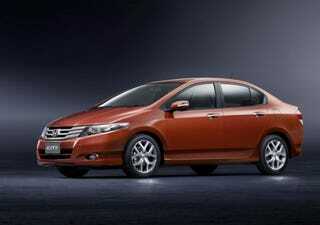 *1 1.5-liter subcompact sedan category *2 Thailand, Philippines, Malaysia, India, Pakistan, China, Turkey.